Bitdefender Total Security 2016 is the ultimate internet security software. Its unbreachable protection is now also non-intrusive and fast, thanks to Bitdefender Photon, an innovative scanning technology, which understands and adapts to the way users use their PC. It has a dedicated online transactions guardian called Bitdefender Safepay, as well as many other technologies dedicated to protecting users’ privacy online and offline. Among them are device anti-theft, secure online storage and synchronization, tune-up and optimization, network protection (firewall), parental control, Cloud antispam, privacy protection on Facebook, and early warnings of risky, fraudulous websites, to name a few. 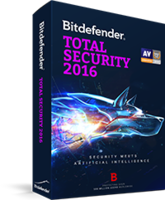 Bitdefender Total Security 2016 keep to the Autopilot philosophy and takes all security-related decisions for the user. Zero configurations. Zero questions. Enhanced! Bitdefender Safepay™: Keeps hackers at bay by automatically opening all your online banking pages in a separate, secure browser, and keeps all necessary credentials safe and within your reach. Two-way Firewall: The two-way firewall continuously monitors your Internet connections and prevents unauthorized access, even over a Wi-Fi network. Enhanced! Cloud Antispam: Stops unwanted e-mail from reaching your Inbox, now fully based on Cloud technology. New! Security Report: This new feature presents your overall security status for the past week, including scans and disinfections, pending issues if any and ways to fix them, as well as feature recommendations and notifications of unused modules. Security Widget: Enables you to keep track of all of your security-related tasks, plus lets you quickly and easily drag-and-drop files for quick scanning for viruses – right from your desktop! USB Immunizer: Immunizes any Flash Drive from viruses when they’re connected to your computer so you never worry again about USBs infecting you or your friends. Bitdefender Autopilot™: Provides a hassle-free experience by making optimal security-related decisions with no input from you. This means no pop-ups, no alerts, nothing to configure. Bitdefender Safepay keeps hackers at bay by automatically opening all your e-banking and e-shopping pages in a separate iron-clad, secure browser. From here on, Safepay also keeps your sensitive data (required to complete online transactions), closely within reach, in a secure manner, via Bitdefender’s new Wallet feature. Bitdefender now introduces a fully-fledged Wallet, which allows you to quickly access your sensitive credentials, and even automatically fills them for you to save time. Security Report: how can you not keep an eye on Bitdefender, but still know that it’s doing its job? You can trust it or you can visit our weekly security report. This new feature presents your overall security status for the past week, including scans and disinfections, pending issues if any and ways to fix them, as well as feature recommendations to help you get the most from your Bitdefender product. Bitdefender has fully migrated the antispam engines to the Cloud. The results are even better detection rates, lowered system load and a very small footprint on disk. Bitdefender’s Parental Control technology has been partially redesigned, to include complete coverage on all Windows environments, even Windows 8 and Windows RT, HTTPS support, an intuitive user experience on Facebook and substantially more details and options for this social network. Internet Explorer 7 and higher.NET Framework 3.5 (automatically installed by Bitdefender if necessary).